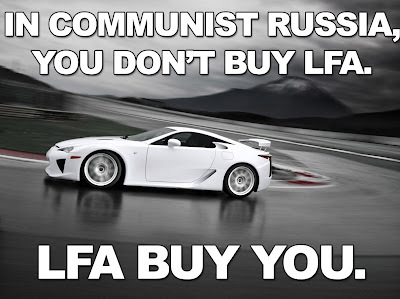 Yes, I came up with a lame Communist Russia meme for this article. I apologize. I also apologize again, for the hazy pictures caused by condensation inside of my iPhone's camera lens. Please allow me to explain though. This car is so exclusive, that even though it came with a $375,000 price tag, you couldn't choose whether you wanted to buy it or not. That's right, Toyota invited you. So in that case, I think it's perfectly appropriate to say that "In Communist Russia, you don't buy LFA, LFA buy you." 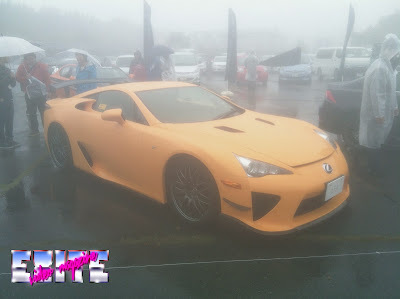 I saw this car at Super GT at Autopolis, and I almost didn't take the photo. Super cars just don't appeal to me in the slightest. In all honesty, I really only like the Ferrari F40, and (if you can call it a super car) the Porsche GT3. Not only will I never be able to afford one, even if I could... I could buy a Hakosuka, Kenmeri, DR30, R32 GTR, R33 GTR, R34 GTR, and R35 GTR for the same price roughly. I would much rather have an amazing Skyline collection than ONE douchebag whip. But, I did end up taking pics, as you can see. I mean out of all the super cars, it is one of the more rare ones, and to be honest, it's the first LSF I've ever seen in person. I also couldn't resist the first shot at the top. The line of sight was just too good. 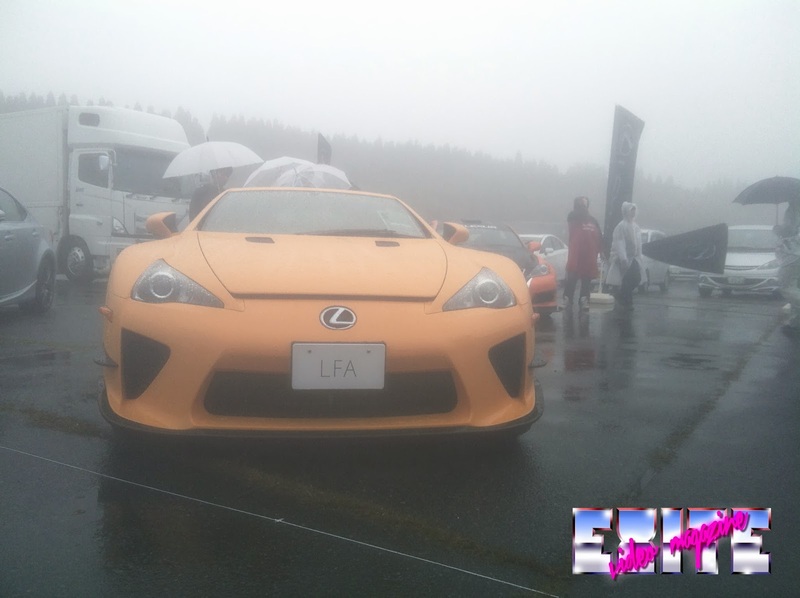 The LFA began developement in the early 2000s, and the first prototype was displayed in 2005. The production model was shown at the 2009 Tokyo Motor Show, and went into actual production in December 2010, as a 2011 model. They made roughly 20 cars a month, until the 500th car rolled off of the assembly line in December of 2012. It was a Nurburgring special edition. On the performance side of things, the car was incredibly light for a super car, using a chassis that was composed of 65% carbon fiber. The 4.8-liter V10 1LR-GUE put down roughly 560PS at 8,700RPM. 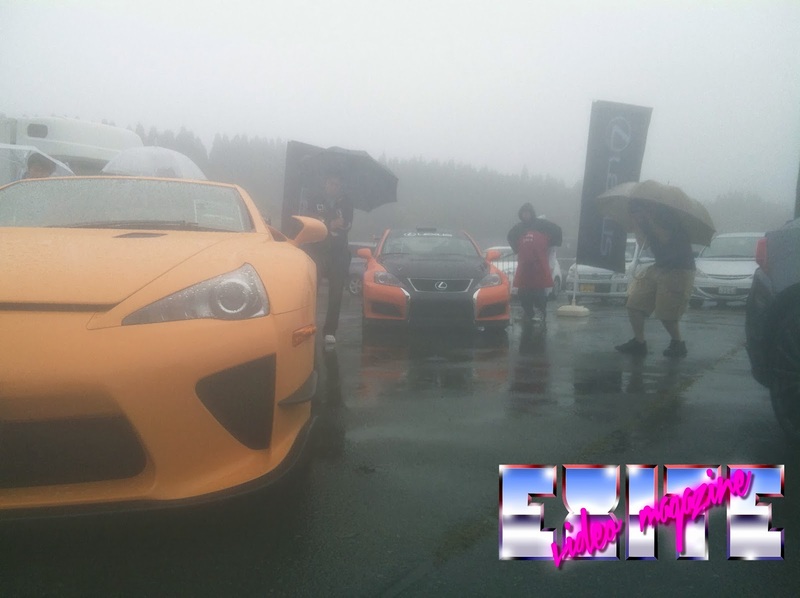 The power was channeled through a 6 speed automatic sequential transmission that could be controlled through paddle shifters. This was sent down through BBS 20x10.5 front wheels, and 20x12 rear wheels. So I promise I won't make super cars a regular thing, unless you want me too. Sound off in the comments below and let me know if you want to see more super cars or not.